One of my absolute favorite kitchen tools is my cast iron skillet. Actually, I have three cast iron skillets of different sizes, one to fit every need. I use them all the time, for every meal of the day, including desserts. Cast iron is durable and versatile. With just a little bit of maintenance, it will last a lifetime. Many cast iron pots and pans have even become family heirlooms which are passed along from one generation to the next. One of the most important ways to keep a cast iron pan looking new is by keeping it seasoned. Most cast iron comes pre-seasoned in the store. However, using and washing cast iron can wear away the seasoning. 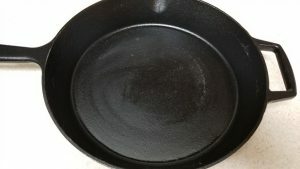 To quickly re-season a cast iron pan, rub a clean pan with a thin layer of canola oil and place it in a hot oven (350 degrees F) for one hour. Speaking of washing cast iron, I generally do not, at least not in the traditional sense of using soap and water. Once the pan has cooled enough to handle, I usually just wipe it out with clean paper towels. For those few stuck on bits, I add a little table salt to the pan and then wipe it out. The salt acts as a mild abrasive without damaging the pan. Cast iron can be washed in warm soapy water, especially if it has not been used for a long time. Be sure to thoroughly rinse off all the soap, then re-season the pan before using it again. Treating cast iron right will help ensure it stays in good shape for a long time to come. Besides keeping it seasoned, preventing or removing any rust is another cast iron best practice. Well-seasoned pans should not rust. However, older pans that have not been used a lot may rust over time. Have no fear. They are salvageable! To remove rust from a cast iron pan, gently scrub the rust away with kitchen grade fine steel wool. Wash the pan with warm water and soap, scrubbing more if needed, then dry thoroughly. Season the pan as stated above and let cool. The pan should be as good as new. One of the biggest complaints regarding cast iron is that food tends to stick to it. There are three good ways to help prevent this from happening. First, let meat rest at room temperature for about 30 minutes before adding it to the pan. Cold meat is more likely to stick. Second, preheat the skillet so it is nice and hot before adding food to it. Add oil to the pan during preheating. Food is less likely to stick to a hot pan. Third, do not overflip food, especially meat. Letting meat sit undisturbed in the pan until it is seared evenly on one side or the breading is golden brown will help reduce the chance of it sticking. Turning it constantly or sooner than it is ready may cause food to stick. Another good cast iron practice is to use the proper tools. Plastic, wood, or silicone utensils are recommended for use with cast iron. Metal utensils may damage the pan. Since the entire pan gets hot, including the handle, always use proper protection when handling the pan to prevent burns. Cast iron pots and pans are some of the most durable and versatile kitchen tools available. Their ability to go from stovetop to oven makes them must-haves for any home chef. Taking proper care of them will ensure they last for a lifetime and beyond. 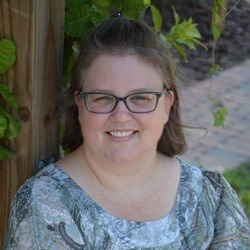 For more information about cast iron cooking and care, please call Samantha Kennedy, Family and Consumer Sciences agent, at (850) 926-3931.